Ah, limited-edition eyeshadow palettes from Stila. Does it get any better than waiting for the new ones to arrive on the shelves each season? This beauty chick thinks not. And if you're of the same mind, you'll absolutely love the new Acapulco Eye Shadow Trio. 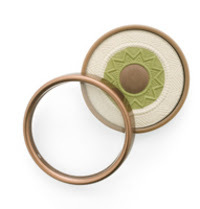 Open up the round, lacquered bronze palette and find within some of the most gorgeous shades this side of the Pacific, designed in a unique sunburst pattern that almost -- hey, I said almost -- makes the colors too beautiful to touch! But if you can bear to dip a brush inside, you'll find three blendable hues that can each be used as base, crease and liner! There's golden white shimmer around the rim, olive green flecked with sparkles in the middle and a gorgeous rich chocolate in the very center.